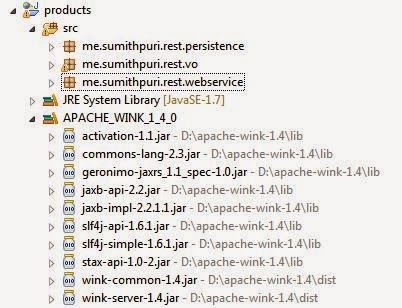 If you want to use REST over SOAP, you can get working with your HTTP methods by using Apache Wink along with your Java projects. Works on HTTP protocol, as compared to SOAP, which has its own protocol. Uses HTTP GET, PUT, POST, and DELETE as compared to SOAP which uses only POST. It uses the HTTP infrastructure, whereas SOAP is transport neutral. The producer and consumer are aware of the content being exchanged. It does not support many non-functional requirements or any WS-* standards. Create a Dynamic Web Project in Eclipse. Build a Core Application that performs CRUD Operations. Add the Supporting JAR Files in the Build Path. Create the REST Web Service using Apache Wink (GET, POST, DELETE, PUT). To allow Apache Wink to locate this service as a REST web service, you can either define an additional class or configure an application file. We are using an application file to mention all our web services. You can place this under WEB-INF/and name the file simply ‘application’ (without any extension). Create a Java project in Eclipse. Include the Support Client JAR files in the Classpath. Build the Client to Test or Access the GET method. Build the Client to Test or Access the POST method. Build the Client to Test or Access the DELETE method. Build the Client to Test or Access the PUT method. 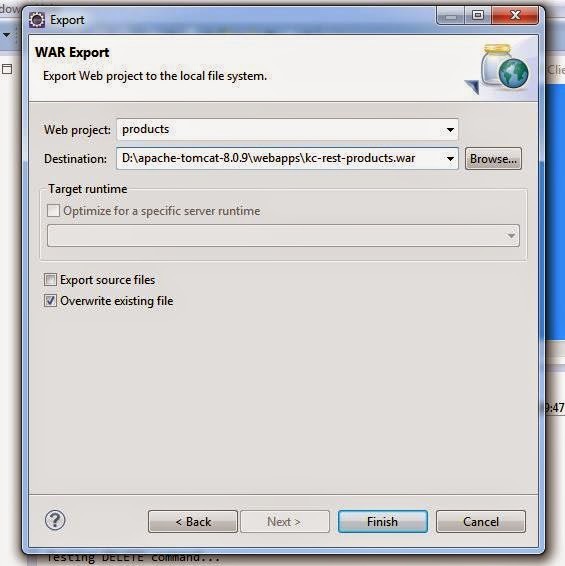 You may download the products.war (including source) web service as well as the products-client.jar (including source). In this blog, you have seen how to build REST web services using Apache Wink for basic data types. Next, I will blog on how to include Jackson or Jettison as the stream reader or stream writer JSON libraries so that we can read and write complex or application object types. It will be titled "JAX-RS (REST Web Services) using Apache Wink - 02" [REST Using Apache Wink and Jackson/Jettison].